This past decade has seen further clarity develop around the provision of mandibular repositioning devices (oral appliances for snoring and sleep apnoea). The same year saw the BSDSM protocol further endorsed by the Association of Respiratory Technology and Physiology in their Standards of Care position statement [iii]. This was updated in 2018 to version 4. [iv]. I’m a sleep-industry insider (learn more about me: Adrian Zacher) ↗ with a quarter of century of sleep medicine experience. The Californian Dental Association (CDA) [v] determined in 2012 that it is appropriate for dentists to screen patients for the signs and symptoms of sleep disordered breathing (SDB) and work with physicians to diagnose and treat SDB. The CDA also stated that SDB is a medical condition and its diagnosis is outside the scope of the practice of dentistry. This is all excellent progress towards appropriate patient assessment, screening and where appropriate provision of an MRD by a dentist. How to discourage the medical profession from supplying or by lack of guidance endorsing, use of ‘Boil & Bite’ devices. A multi-disciplinary, holistic view of the patient that breaks down the current silo approach to patient care surely makes ethical and financial sense. Perhaps raising awareness that effective treatment options for OSA exist and consensus development of guidelines that dentistry is not within the purview of a physician is required? Let’s not even talk about professional indemnity…! 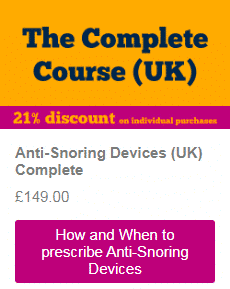 Professor Stradling and Mr Grant Bates proposed GP Guidelines ‘Management of sleep apnoea and snoring, suggested guidelines for General Practitioners and other interested medical professionals’. I would note that this document was created prior to the BSDSM Pre-treatment Screening Protocol. [ii] Jauhar et al (2012) The Kushida Index as a screening tool for obstructive sleep apnoea-hypopnoea syndrome, http://www.nature.com/bdj/journal/v212/n1/full/sj.bdj.2012.2.html [accessed 1 February 2012]. Created by Adrian Zacher. Last updated 23 Oct 2018. If you have more great post about dentistry, can you post it on my forum?